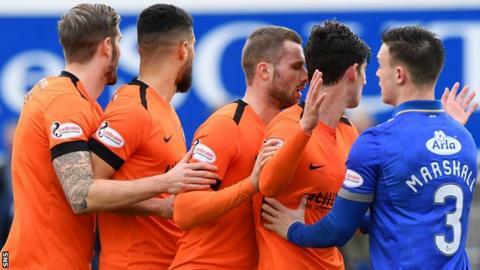 Nicky Clark's first-half penalty took Dundee United to within three points of Championship leaders Ross County after a third league win over Queen of the South this season. Barry Maguire brought down Peter Pawlett and Clark hit his eighth goal of the season after the Motherwell loanee was sent off for the challenge. A Stephen Dobbie free-kick flew just wide for 10-man Queens after the break. And Kyle Jacobs rattling the bar with another effort from outside the box. Queens midfielder Nicky Low and United counterpart Ian Harkes tested referee Andrew Dallas' patience with a fight near the end, but the official flashed yellow cards when many of the 2012 fans thought they too might have been shown red. Queen of the South assistant manager Dougie Anderson: "It was a traditional game of two halves and, despite being down to 10 men, we were more attack-minded in the second half. "We hit the bar and they gave everything, but it is a harsh lesson and the penalty changed the game. "We need to address our run of form in terms of results, we need to get points on the board and, with a run of three games coming up, we need to start picking up points. "They are all big tests in The Championship, and the difference between a relegation battle and the top four is probably as close as it has ever been." Dundee United head coach Robbie Neilson: "That was a massive win for us given the fact that only ourselves and Morton have won here in the league this season. "Ayr and Ross County have both been beaten heavily here, so I'm delighted for the players and the fans that we got the win. "It is going to be extremely tight at the top over the next few weeks and wins like this are big." Match ends, Queen of the South 0, Dundee United 1. Second Half ends, Queen of the South 0, Dundee United 1. Nicky Low (Queen of the South) wins a free kick in the defensive half. Foul by Osman Sow (Dundee United). Attempt missed. Charlie Seaman (Dundee United) right footed shot from the centre of the box is too high. Attempt saved. Stephen Dobbie (Queen of the South) right footed shot from the left side of the box is saved in the bottom left corner. Substitution, Dundee United. Samuel Stanton replaces Peter Pawlett because of an injury. Attempt saved. Lyndon Dykes (Queen of the South) right footed shot from the centre of the box is saved in the bottom right corner. Substitution, Queen of the South. Ian McGrath replaces Kyle Jacobs. Corner, Queen of the South. Conceded by Paul Watson. Ian Harkes (Dundee United) is shown the yellow card. Nicky Low (Queen of the South) is shown the yellow card. Foul by Nicky Low (Queen of the South). Ian Harkes (Dundee United) wins a free kick in the defensive half. Foul by Lyndon Dykes (Queen of the South). Pavol Safranko (Dundee United) wins a free kick in the attacking half. Substitution, Dundee United. Paul Watson replaces Paul McMullan. Peter Pawlett (Dundee United) wins a free kick in the defensive half. Attempt missed. Osman Sow (Dundee United) left footed shot from outside the box misses to the left. Substitution, Dundee United. Osman Sow replaces Pavol Safranko. Attempt saved. Kyle Jacobs (Queen of the South) header from the centre of the box is saved in the centre of the goal. Corner, Dundee United. Conceded by Scott Mercer. Foul by Scott Mercer (Queen of the South). Jamie Robson (Dundee United) wins a free kick in the defensive half. Corner, Dundee United. Conceded by Iain Wilson. Attempt missed. Stephen Dobbie (Queen of the South) right footed shot from outside the box is just a bit too high from a direct free kick. Andy Stirling (Queen of the South) wins a free kick in the attacking half. Nicky Low (Queen of the South) wins a free kick in the attacking half. Foul by Nicky Clark (Dundee United). Attempt missed. Charlie Seaman (Dundee United) right footed shot from outside the box is too high from a direct free kick. Nicky Clark (Dundee United) wins a free kick in the defensive half. Attempt saved. Pavol Safranko (Dundee United) header from the centre of the box is saved in the top centre of the goal. Corner, Dundee United. Conceded by Alan Martin. Attempt saved. Paul McMullan (Dundee United) right footed shot from the centre of the box is saved in the top right corner. Pavol Safranko (Dundee United) wins a free kick in the defensive half. Foul by Callum Fordyce (Queen of the South).